Olivier's treatment of this sequence is highly cinematic and focuses on Ophelia, not her brother, with massive cuts to his lines. Between the first and second parts of Scene 5, Olivier inserted Horatio's receipt of a letter from Hamlet, and it's at the end of that scene that Ophelia crosses his path, singing one of her songs. It increases the irony of her coming suicide because she almost learns her lover is coming back, or she might have heard, and his return is part of her nihilistic motivation. 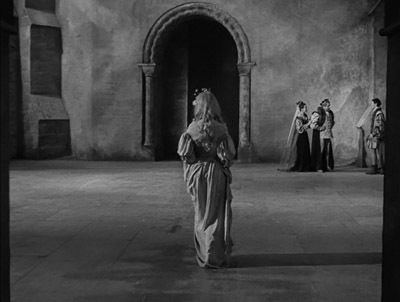 In any case, the camera follows her to the great hall where Laertes' sequence is already in progress. It removes the rabble at the gates and makes unclear the wronged son's ire towards the King. It's all on her, and the argument her brother is having with the Royals is just background noise, noise she interrupts with her entrance. We don't see her face until she speaks (singing excluded), which turns her into a ghost, with a function similar to the capital "G" Ghost of the play in the closet scene. She dispels the rage and violence in the scene, possibly prevents a misunderstanding from leading to murder. Laertes is haunted, and Ophelia is a sort of spirit, not truly connecting with the world around her. After Laertes' initial reaction, we stay with Ophelia, she walks out of the room, speaks lines to herself, leaves rosemary on Hamlet's chair (asking him to remember), returns to the hall. And they don't follow her. They're stunned. She might as well be walking through walls. Ophelia is isolated - by choice, in a sense - and impossible to communicate with. The three onlookers don't even try. She gives them flowers (appropriate to their sins), and Gertrude is made to break down and cry, but they don't respond verbally. Even Laertes' running commentary is mostly removed. In the end, Ophelia walks away, crumples by an archway, crosses herself, looks back (though we never do), and seems to make her decision to commit suicide. What she imagines or reasons at that moment is a mystery. Does she imagine her brother will now avenge her father, and that her work is done? Does she realize she's lost any connection she might have had to the people behind her? We don't know. But Olivier certainly shows us that crucial moment of decision. The camera hangs back (and still no reaction shots), watches her leave the room, then follows her, but she's gone. And the image dissolves into that of the brook as Gertrude's telling of Ophelia's final moments begins. It's obvious Olivier draws a straight line from this moment to that fatal one, and in a way that could only really be done on film.